WESTBOROUGH - On a sunny afternoon this week, Yening Zhou entered his parents’ apartment to check in on them, as he did every day at the same time. His mother, Yuee Zhou, had recently confided in him that she was concerned about her husband’s behavior. Although he had not been clinically diagnosed with dementia, Jieming Liu, shaky and frail at 79, exhibited the symptoms, and family members were convinced he was afflicted by the disease. In November, Liu and his wife left their life in Hunan Province in China and moved to a small apartment in Shrewsbury, so their son, who lives nearby, could routinely look in on them. When Zhou opened the door Thursday, he encountered a scene so grisly that even weathered law enforcement officials appeared strained to describe it. Yuee Zhou, 73, lay face down in a pool of blood. Her lower left arm was detached at the elbow and gnawed to the bone. Blood and bits of human tissue were scattered around the apartment. “It may have been due to the defendant eating her flesh,’’ Assistant Worcester District Attorney Michael McHugh said Friday. Violence is uncommon among people suffering from dementia, and acts of extreme violence are rarer still, said specialists who were stunned by allegations that a Shrewsbury man stricken with the condition had brutally slain his wife. Authorities found Liu sitting on a rocking chair next to his wife’s body, his body, including his face, smeared with blood. “The only thing he mentioned to us was the words ‘self-defense,’ ’’ Early said. 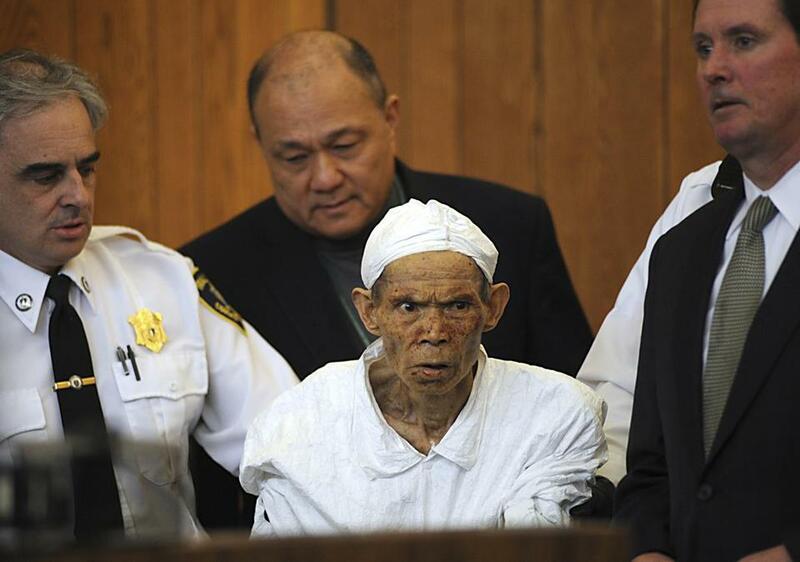 Liu was charged with murder, mayhem, and assault and battery in Westborough District Court Friday morning. Judge Vito Virzi ordered him to undergo a mental evaluation, and Liu was held without bail pending a May 14 status hearing. “I haven’t seen this type in Worcester county; none of the police officers that were working the scene have seen this type of homicide before,’’ said Worcester District Attorney Joseph D. Early Jr. moments after the arraignment. Shrewbury’s last homicide was in February 2010, a domestic violence incident, according to police. The number of homicides in the past decade could not be confirmed late Friday, but police said there probably were no more than six. Residents expressed shock Friday about the details of this latest killing. “I thought it was really strange, these two old people looking through the trash,’’ Lopes said in Portuguese during a telephone interview. Prosecutors and Liu’s attorney said it is apparent that the defendant suffers from dementia and possibly Alzheimer’s disease. During the arraignment, Liu appeared bewildered as he stood next to his attorney, Michael Hussey. Liu moaned and rocked back and forth as if in pain, at one point resting his head on a waist-high railing in front of him. Hussey entered a plea of not guilty on his client’s behalf. Lui’s son, Yening Zhou, was in the courthouse, but declined to comment though a spokesman for the prosecutor’s office. Hussey said Liu did not recognize his son when he picked up his parents at the airport last November. Zhou, 51, would “check in’’ on his parents every day between 4:30 and 5 p.m. Police had never been called to the couple’s apartment on Green Drive, and no restraining order had been filed by Yuee Zhou against her husband. Yening Zhou told authorities, according to a police report, that in the midst of the bloody scene, his father kept repeating, “This is not your mother.’’ Zhou called 911 and told the dispatcher, “I think my father did it,’’ according to the report. Liu, who speaks no English, was interviewed Thursday with the help of a Boston police officer who speaks Mandarin. After he was arrested and read his Miranda rights, Liu told authorities the injuries to his hands were the result of self-defense. He then told police he wanted a lawyer. Brian R. Ballou can be reached at bballou@globe.com. Follow him on Twitter at @globeballou.